The Heat, the Hiking and My Life! It is pretty commonly known that it's hot in Arizona, and now thanks to the miracles of modern technology (with a little help from the National Weather Service), you can see immediately just how hot it really is down here. Of course anybody native to Tucson would claim that if it's not over 100 °F (38 C) then it's not hot, but you have to expect that sort of thing from people who have been in the sun a little too long. 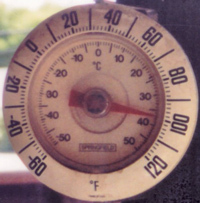 Personally I still think it gets hot when the temperature rises above a mere 95 °F (35 C). The really great thing about Tucson is the mountains surrounding the city. Even when it is 110 °F (43 C) in the shade, the mountain tops are a nice comfortable 80 °F (27 C) or so. With an average of 360 days of sunshine a year, what this really means is that Tucson is a great place for hiking all year round! Being the avid hiker that I am, I have naturally been exploring the mountain trails. Even after many years, I am still adjusting to the fact that all of the native plants here bite back, but the spectacular views sure make up for any inconvenience a few cacti make. My favorite place so far is the top of Mt. Wrightson which is located in the Santa Rita mountains to the south of the city. On a clear day from the top you get a full 360 degree view of everything from the cities of Tucson and Nogales as well as deep into Mexico and much more. The 5,000 ft. (1,500 m.) climb is well worth the effort as the view is simply spectacular. Because of our tendency for warm weather, it is not often that I get the chance to brag about how cold it is here. When that time comes however, it is well worth it! 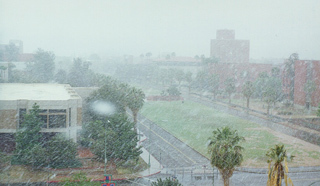 The picture below was taken from the University of Arizona campus on April 4, 1999, and clearly shows the snow falling! It was a freak storm to be sure, but for about an hour or so I was running around like mad trying to get some pictures of it. I mean ... would you have believed me if I said it snowed in Tucson in the month of April?! In the 8+ years I have been living here, I have actually only seen it snow in the city one other time. Of course anybody who lives in Arizona is almost required to see the Grand Canyon National Park at some point. I had decided when I moved down here that I had no intention of visiting the Grand Canyon unless I could actually hike down it. Well, it took almost two years of waiting before the opportunity arose, but the wait was worth it. Not only did I get to hike down it, but a friend arranged the trip such that we actually got to hike across it. For anybody visiting the canyon I highly recommend that you hike at least part of it. The way I see it is that if you don't actually hike it and get a feel for the shear vastness of the canyon then you might as well just look at some pictures. In any case, if you ever decide to do some hiking in Arizona, don't forget to bring lots of sunscreen, plenty of water, and most importantly ... don't run into any cacti. If you loved/hated this page, or have any comments, please send e-mail to comments@gravitysmith.com and I will personally respond. Please note that your privacy is very important to me. There is nothing I hate worse than spam and I will never use or release your information for any solicitation purposes. Also note: All weather related data on this page is courtesy of the National Weather Service in association with NOAA and is freely available to the public. As such, the weather related data on this page is not subject to the copyright protection on the remainder of the page.